The Museum acquired Bill Adler’s Eyejammie Hip Hop Photography Collection in 2015, which provided the impetus to create the recent exhibition, Represent: Hip-Hop Photography. The Eyejammie Hip Hop Photography Collection consists of nearly 500 images from more than 40 photographers. This is the largest collection of hip-hop images held by the Smithsonian’s National Museum of African American History & Culture. Recognizing hip-hop as a culture that permeates many aspects of modern society, this is a timely show to include at the Museum. Created in the Bronx, New York, in the 1970s, hip-hop is nearly fifty years old. The local, youth based art form, has grown into an international phenomenon over the years. 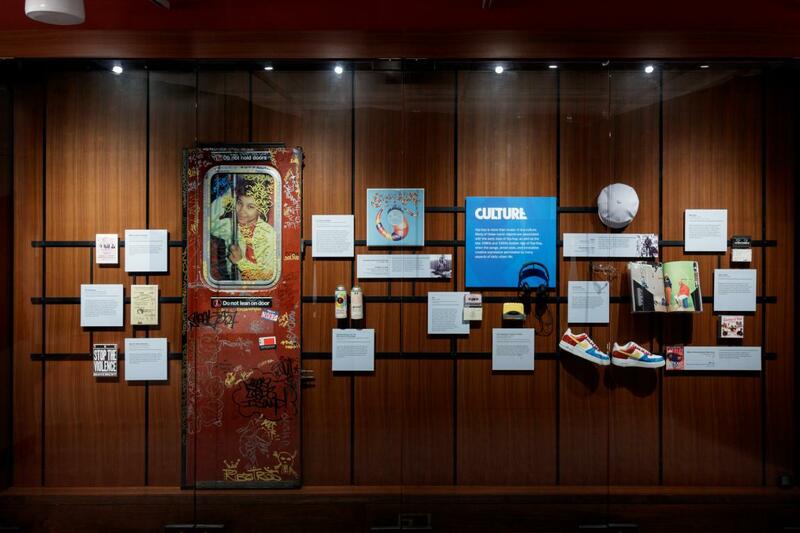 Using the four elements of hip-hop (MCing, breakdancing, graffiti, and DJing) as an organizational tool, I created four exhibition areas to highlight aspects of hip-hop: identity, community, activism, and creativity. Hip-hop, like so many things, is part of a larger socio-cultural context. I use images from the museum’s permanent collection and pair them with images from the Eyejammie Hip-Hop Photography Collection. I created these pairings, or diptychs, to make connections between the past and present. The relationship between these photographs broaden the considerations and cultural significance of hip-hop within American society. Moreover, hip-hop is about adaptation and innovation, and a remixing and re-interpretation of ideas. These works “represent” that notion through the photograph’s reinterpretation of history. Two epigraphs on the introductory panel embody the point of the exhibition. One epigraph comes from William Shakespeare: “What is past is prologue”; the other comes from Jay-Z: “I’m not looking at you dudes, I’m looking past ya.” I consider both artists poets. One is an historic figure and the other is a contemporary artist; and like the spirit of hip-hop, both highlight a connection and relationship between poetry and hip-hop. These phrases point out what I am seeking to do with the show, which is to make connections between the past, present, and future and show how hip-hop did not originate in a vacuum. Represent: Hip-Hop Photography. The Eyejammie Hip Hop Photography Collection. I also include a few objects that speak to the creativity and culture of hip-hop. We have a subway door full of graffiti on loan from photographer Jamal Shabazz, with a great image of his included in window of the subway door. Shabazz is an important photographer who has been documenting everyday life in New York and has been documenting hip-hop culture since its inception. The pre-release mix tape of Nas’s Illmatic, as well as a studio demo of Mobb Deep’s second album, coupled with Big Boi’s Air Force Ones and some old school hip-hop party flyers also demonstrate the various elements of hip-hop. The interactive table in the center of the space highlights more images from the Eyejammie collection; and the excerpts from the films Wild Style, Graffiti Rock, and Stretch and Bobbito: Radio That Changed Lives further demonstrate the impact and evolution of hip-hop culture.